Airborne is ready for battle. The ultimate goal of this project is to not only fix the broken G.I. Joe figures from my childhood, but to find their original accessories, as well. So far fixing the figures has been easy enough. I still have the pieces for many of them. 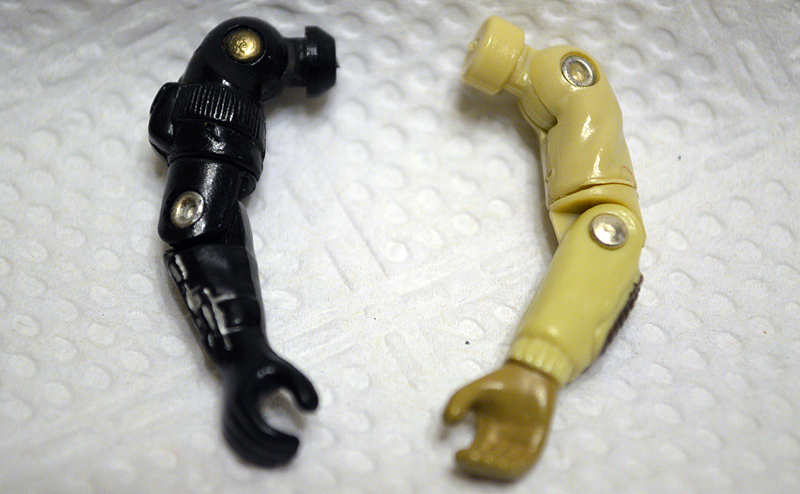 It’s just been a matter of getting new o-rings to reattched the three main parts – legs, waists and torsos. Airborne has become the first of my figures to be completed. Airborne’s case of crotch breakage has been cured. 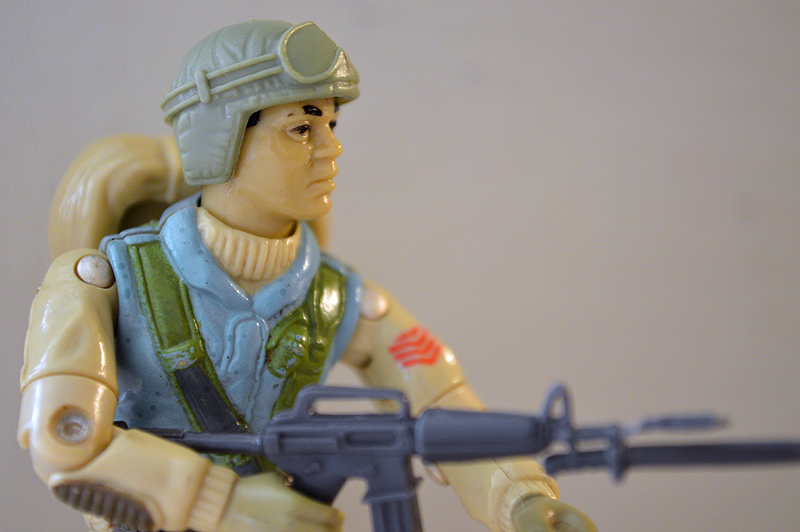 One had Airborne’s original green helmet. The other included his backpack and M-16 fixed with bayonette. Through my research I’ve found several people report that G.I. Joes feature slight differences from year to year (not including the more extensive redesigns that have happened). There are also differences from figure to figure. I’m going to chart a few in an upcoming article, but one I noticed in the case of Airborne was the shoulder joint. 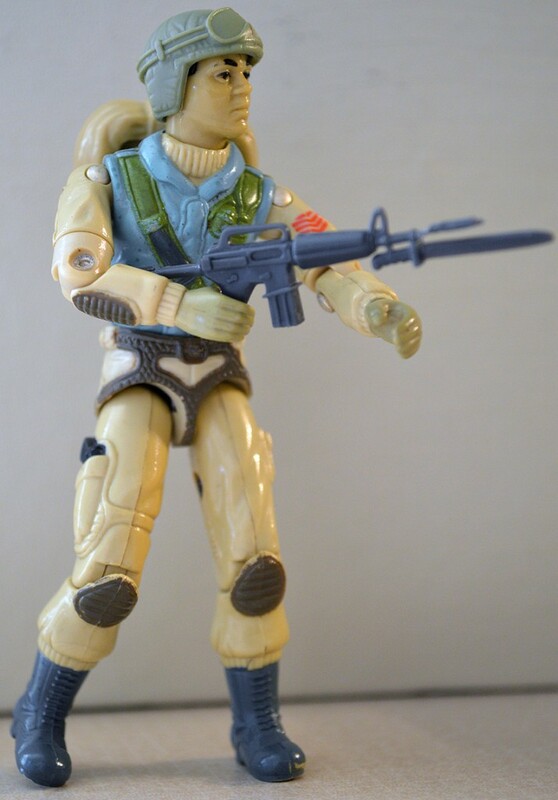 Released in 1983, the G.I. Joe figures featured a rectangular joint. This continued until 1985, when the figures included a more triangular design. Early G.I. 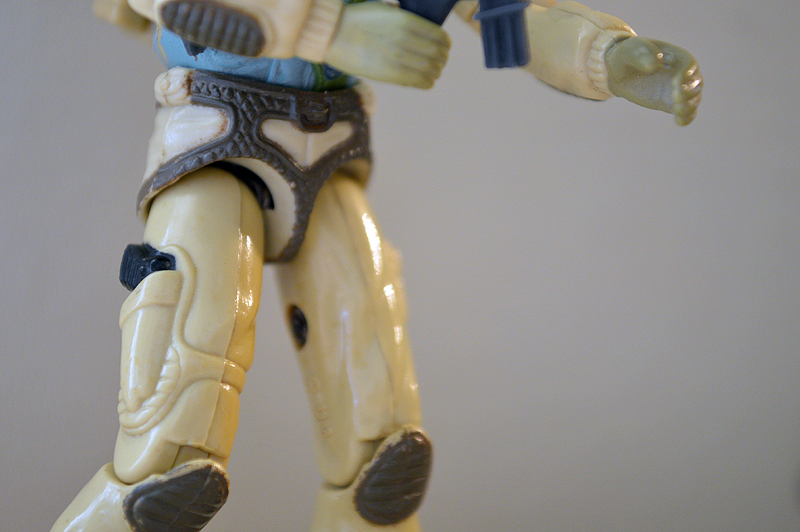 Joe figures feature rectangular arm joints. From 1985 on, they became more triangular, allowing for more room for the o-rings inside. This isn’t that big of a deal, but as I was reassembling Airborne I found that the original batch of o-rings I bought didn’t work well with him. When I screwed him back together a his shoulders and neck weren’t closing neatly. Part of the reason for this was the shape of his shoulder joints. I switched to a slightly smaller 0-ring and that fixed the problem. Initially I was using a #10 (11/16″ Outer Diameter x 1/2″ Inner Diameter x 3/32″ Thickness). These did the job well, but after the issue with Airborne I decided to switch to #9 (5/8″ O.D. x 7/16″ I.D. x 3/32″). The thickness doesn’t change, but with the smaller dimensions comes more stretch which thins out the o-ring more. With all that sorted, Airborne gets to be re-armed and ready for action. I believe so. Will have to investigate further, but I was certain this was the original gun that came with the figure.